You’ve been looking for that little entrepreneurial nugget to boost your revenue stream without sapping too much of your already-stretched resources. Congratulations, because you’ve just found it! 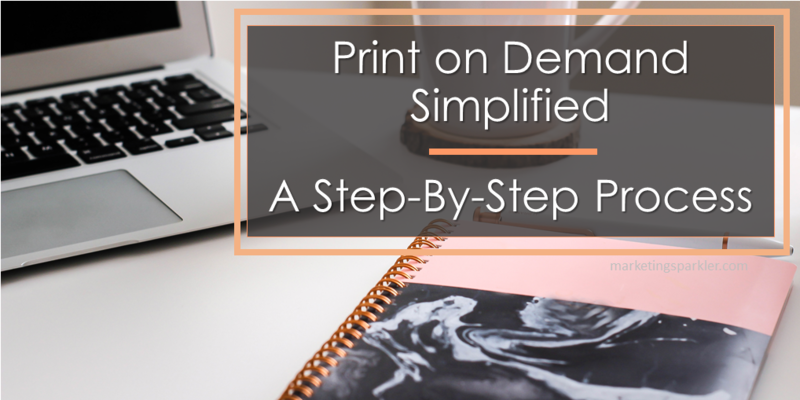 Print on demand (POD) is the ultimate way to bolster your ecommerce efforts with very little legwork from your side. What’s more, coupled with a creative social media strategy, your business has the potential to make a mint with print. I’m sure I don’t need to convince you about the rise of ecommerce. As a forward-thinking entrepreneur, you’ve no doubt already begun your exploration into the world of the digital marketplace. As you may already know, eCommerce currently represents 10% of all retail sales in the US with an expected year-on-year growth of 15% per annum. With that kind of upward trajectory, the decision to take your business operations into the digital world is a no-brainer. What’s more, ecommerce provides opportunities that require minimal startup fees and have the potential to quickly generate passive revenue. Ecommerce has become so much more than simple online shopping. Technological developments have catalyzed a revolution in how marketplaces operate, affecting everything from manufacturing processes to payment methods. The best example of this is print-on-demand (hereafter, POD). In this piece for Entrepreneur, Abhishek Agarwal sites a recent Global Industry Analysts report that predicts that the global web to print market is set to reach US$1.3 billion by 2022. The writing is printed on the wall – if you had heard that print was dead, know that the sequel to that story outlines its resurrection. But where did this print revolution come from, and more importantly, how exactly can it benefit your business? Let’s start by having a quick look at the industry’s genesis and then segue into how you can use it to increase your ecommerce profits. Many ecommerce opportunities require minimal startup fees, with potential to generate passive revenue. Once upon a time, there was the death of print. Imagine a time when reading from a screen was not a perfectly normal activity, when trains were filled with people with books in their hands, when the pages of news articles were not scrolled through but turned. Yes, not so long ago, print media was how we digested information. Enter the first portable eReader. In a communal gasp, the print industry saw the writing on the wall. The industry had to adapt or die. And adapt it did. Luckily, the coming of the digital age also heralded in great advancements in printing technology that completely disrupted the print manufacturing pipeline. By switching to toner-based and inkjet printing, it became possible to print books only after they were ordered. This meant no stale stock gathering dust on shelves. It meant low-risk and high efficiency. Essentially, it heralded the revival of an industry that was looking at closing its doors. That’s all well and good – but how does this feed into the manufacturing of merchandise to boost your revenue? Quite simply, those same principles, coupled with major technological advancement, offer you the very same benefits that they offered the print media industry. Low startup costs and minimal risks are not the exclusive right of the publishing business, and have come to mean lucrative business opportunities for progressive entrepreneurs. I’ll show you how. In the past, product manufacturing has typically relied on a linear pipeline that started with the creation of a product, moved on to an attempt to try to market and sell that product, and ending with either a profit or a deadly loss. Notice how it is only Step 5 in the process that your merchandise is created? That means low risk and consequently more room to be creative. This method allows experimentation, meaning that you can focus on creating exciting merchandise either as an add-on to an existing venture or as a standalone enterprise. 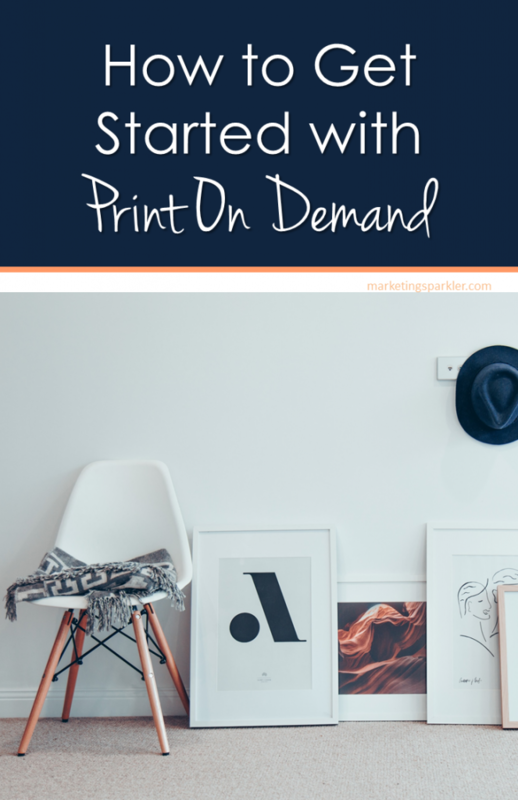 With Print On Demand, you begin with the customer’s order, instead of investment in inventory. Once your new merchandise gains traction on both paid and organic social media channels, you will quickly notice the impact POD can have on your bottom line. The best part is you don’t need storage space, risks on new ideas, or to have major startup capital to launch your venture. Sound good? Now for the really fun part – how to apply this process to your own business? 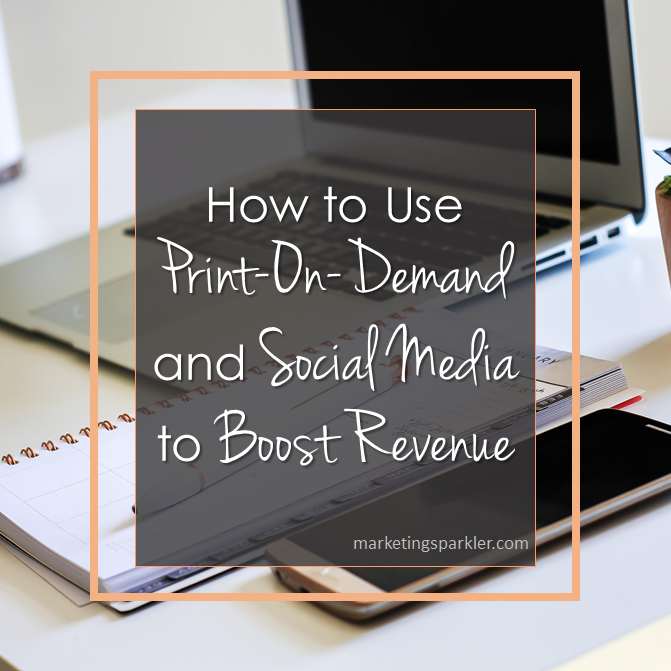 If you’re ready to dive in, you can have your print on demand revenue stream up-and-running in a day, even if you are not endowed with major technical know-how. I will take you through the process step-by-step and by the end of this article you will be on your way to an exhilarating new revenue stream. As the world of ecommerce has grown, so have the available options of ecommerce platforms. The competition for market share is on and in this competitive environment, the difficulty for the store owner is deciding which platform best serves their unique needs. To help you decide, eCommerce Guide has brought out this in-depth comparison that will help you dive into the various options available to you. How much time and energy do you want to dedicate to the creation and maintenance of your store? If you love technical challenges, then going the route of self-hosted platform is a good one. If you prefer convenience, a hosted platform is a better choice for you. Let’s take a closer look. Self-hosted platforms such WooCommerce, the WordPress eCommerce platform, Magento or BigCommerce are all good options. These platforms are high-functioning and provide various integrations and add-ons, from payment processing options to social media marketing plugins. Be warned though, especially when it comes to robust platforms such as Magento, the learning curve is steep and better left alone if you are not a developer or don’t have access to one. Costs can be high, especially when you start factoring site design and maintenance to your budget. If you would like to focus more on your business and less on the upkeep of your site, opting for a self-hosted option is the way to go. Shopify takes all the hard work out of getting an eCommerce store up and running. It’s so easy to use that even “kidpreneurs” make use of the platform to launch their first businesses. 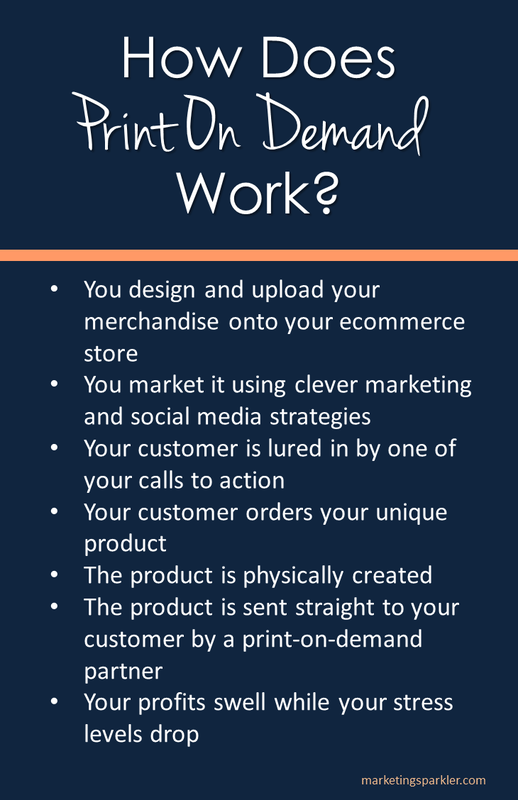 If you would like to be able to focus more on the design and creation of your merchandise, and less on the nitty-gritty of your website, this is the option for you. Shopify also offers a host of integrations and plug-ins, with their library continually growing. Once you’ve chosen your ecommerce platform, it’s time to find your partner in POD success. The best POD integrations are the invisible ones. Yes, you heard that right. Your customers should not be able to see how your ecommerce store and POD plugin work together. This means the technology integration should be seamless and invisibly functional.. Broadly speaking, POD merchandise can be categorized in two ways. The first option is to create merchandise to boost an existing revenue stream. This can be anything from t-shirts for your craft brewery, to band merchandise, to cute tote bags to be sold alongside your YouTube channel. The other option is to create an entirely new business with original merchandise. Get ready to flex your creative muscles, because print on demand has made it possible to put your designs on a huge range of different products. 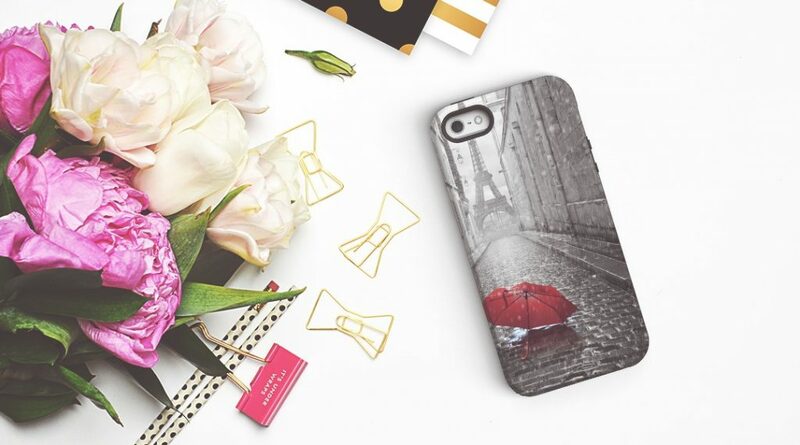 From baby rompers to cell phone covers, hoodies to mugs, canvas prints to stationery lines, the list is almost endless. If you are less-endowed when it comes to the artistic side of things, don’t worry. Freelance platforms such as Fiverr and Upwork have made it very easy to hire expert designers. To tantalize customers with your creative designs, use platforms that allow you to showcase your best products visually. Visual platforms such as Pinterest and Instagram are gaining ground as ecommerce revenue generators. This is the place for monetized creativity. Here’s a fun fact from Forrester Research: Instagram users are 58% more likely to engage with brands they follow compared to other social media platforms such as Facebook or Twitter. This statistic is more telling than the numbers on overall platform usage. When you see social media outlets as conduits for a marketing strategy, you want to be on platforms where people are actively engaged. Broadcasting your message is one thing. Broadcasting your message to the right people who will in turn amplify it is quite another. When it comes to marketing POD merchandise, influencer marketing is the ultimate route. Influencers (and micro-influencers) are open and awaiting your approach. Indeed, it is a credible revenue generator for influencers to support brands. This isn’t just open to the big brands, it can be effective for small specialist enterprises. Organic social media is great, but it’s tricky to get off the ground. The process can take a long time. However, in a bid to encourage individuals and small business owners to contribute to revenue, social media platforms offer large reach for relatively small investment. This is not the big budgets of TV advertising, it is niche targeting with affordable costs. I’ve explored various ecommerce trends. 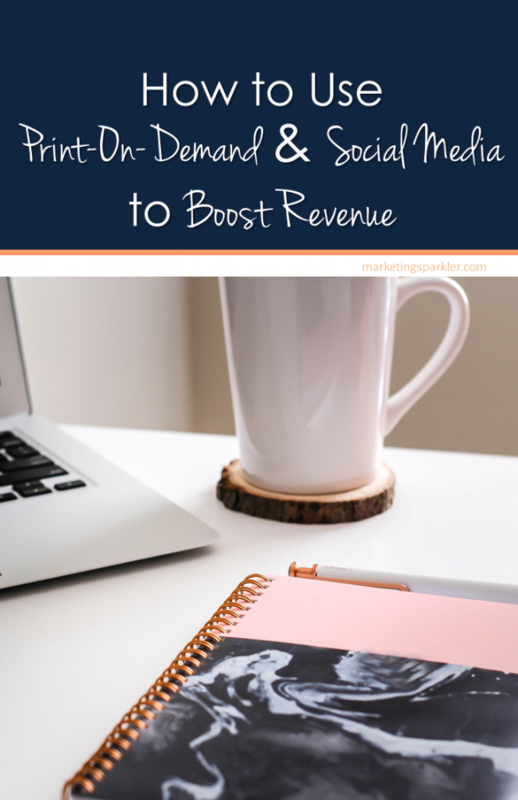 I’ve come to realize that print on demand is unrivaled in how it can boost your existing ecommerce efforts or create an entirely new revenue stream. What’s more, POD and a vibrant social media strategy are happy bedfellows. If you can get qualified traffic flowing to your store through paid and organic social media channels, sales will increase. You can build an army of loyal customers, increasing your reach further than traditional bricks-and-mortar storefronts. Print on demand makes building a stock catalog risk-free, because there are no physical products using space on warehouse shelves. This means that it’s a scalable operation, without the huge overheads that would otherwise cause tension. This is hugely appealing to small businesses. This is a guest post from Charlie Carpenter, the co-founder and CEO of Kite. He is a mobile advocate with over ten years of industry experience. After working for large and small agencies for many years, he co-founded Kite; a software solution for print-on-demand, zero inventory merchandise, and personalized photo print goods. As well as an entrepreneur, Charlie is a seasoned product strategist with experience of various types of digital projects which include: Responsive and Adaptive Websites, Mobile & Tablet Apps, Hybrid Apps, Cross Platform App development. You can connect with Charlie on LinkedIn, and follow him on Twitter.